The one-man alterno-acoustic livewire act from Ohio strikes again. One of the most consistent creative commons artists out there, Josh Woodward is definitely one artist to watch out for every time he releases something new. Dirty Wings is actually an older album from his entire collection, but like most of his work, its filled with catchy, pop, acoustic indie tracks that are nice to sing along to. Perhaps the darkest in terms of lyrics and sound out of all his albums, Dirty Wings is filled with 12 tracks featuring free-form melodies and raw, melodramatic vocals that’s endearing to listen to. You can pretty much say that Josh Woodward is a regular here in Frostclick. His other releases, Only Whispering, The Simple Life and his most current, Breadcrumbs have all been featured and reviewed here. Like most of his other albums, he doesn’t fail in impressing his listeners with his beautiful voice, acoustic/pop alternative flair and his simple yet affectionate lyrics here in Dirty Wings. Much of the time, when I was listening to this album, I keep imagining that it’s playing as background music to some nice rom com movie or even some particular TV show. Woodward definitely doesn’t need to do much to get his audiences attention, all he has to do is sing and play in front of them and they’re hooked. A personal favorite from this album is Gravity. It’s a dark, soft song that’s definitely an easy listen. You can easily download his albums on his official website as well as in various creative commons affiliated sites, but if possible, buy his album if you can. It would be much appreciated. 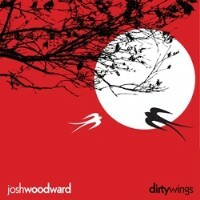 Josh Woodward is certainly an artist worth your time, why not give him a listen now? Actually, all other CDs are CC-BY'd too. Remember to update it soon. Good point. I will fix the rest as well. Thanks a lot.